Ekin Muovi Oy, a Finnish family-owned company, first discovered the advantages of using SAERfoam® on an industrial project in 2012. This development lead the way to further projects, and in 2014, Ekin Muovi started full-scale production of various parts for Scania city buses supplied to both domestic and international markets. The goal was to generate greater technical benefits compared to traditional materials such as Plywood. Technical benefits include superior resistance to moisture, weight savings (3x lighter than plywood) and retaining an equivalent, or superior, stiffness performance to support the load capacity required. Similarly, when compared to laminates based on balsa or high density foams (PVC), there was the additional benefit of reduced cost. 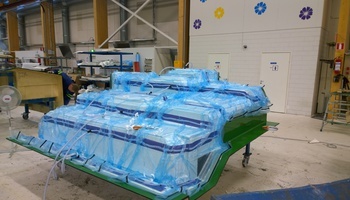 Manufacturing using a Vacuum Infusion Process with polyester resin, multiaxial glass fabrics and structural SAERfoam®, Ekin Muovi also chose to use SAERflow®, a structural flow media to ensure perfect wet-out in the minimum time possible. SAERfoam® can be supplied in various sheet sizes or can be offered in CNC cut kits to facilitate high volume production. Using SAERflow® with its improved resin flow enables reduction in the number of resin feeds without compromising on performance. Additionally, SAERfix® can provide a tailor-made adhesive NCF which reduces preparation time and consumable costs. Cooperation with Ekin Muovi is ongoing with SAERfoam® projects where structural properties, top quality and competitive cost is required. The SAERTEX Team is available to offer technical support to customers who could benefit from using SAERfoam. Ekin Muovi Oy, a Finnish family owned company. 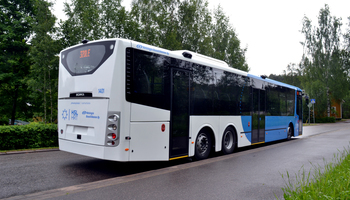 In 2014 Ekin Mouvi started the production of various parts for Scania city buses.